Subscription boxes; they’re everywhere and for everything. And we the British public LOVE them, they’re just flippin’ convenient, aren’t they? You can get subscriptions to socks, boxers, dog toys and even cheese toasties – yes you read that right. I can’t take a walk on the tube without being bombarded by advertising for some of these many subscriptions, they’re simply everywhere. With their huge popularity, it makes sense that subscription razors are leading the charge in the subscription box world. Now I actually have one of those stereotypical, narcissistic, good for nothing bosses that insists we’re all at our desks 10 minutes before we actually start getting paid. He also insists we’re all cleanly shaven, every day, without fail and so I was actually interested to try out a shaving subscription service that was based in the UK. So, one day at work, while no one is looking, in an attempt to reclaim some of my personal life, I decide to research razor blade subscriptions that might save me a bit of time and perhaps even some money. There were a few options out there but after some fairly extensive Googling I opted to try out Sterling Shave Club (www.sterlingshaveclub.com). They seem to essentially be the UK version of Dollar Shave Club but with a classic British twist. ‘Jolly good old chap’ and all that ‘smashin’’ stuff. They had by far the best variety of products, great prices and what looked to be a very flexible, simple to use service. It really is that simple. 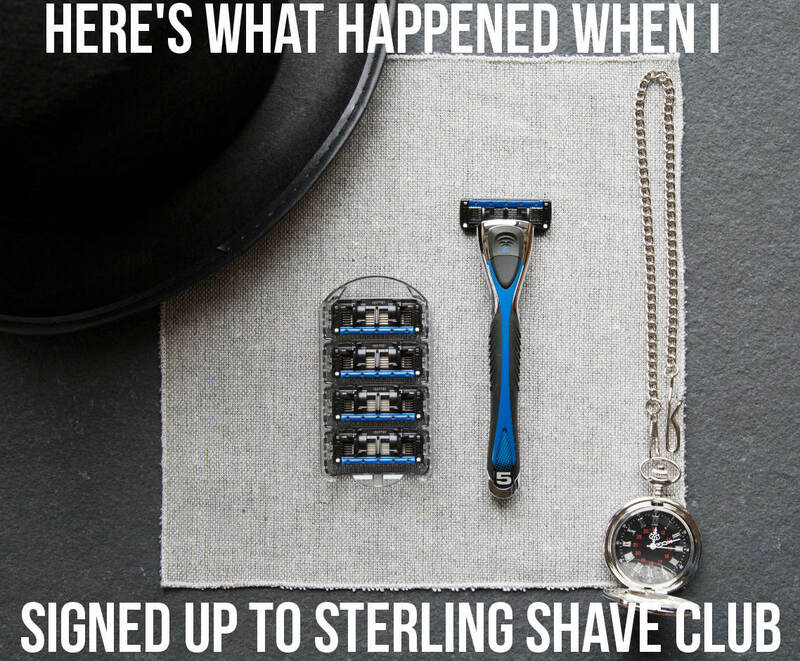 With Sterling Shave Club there were no tie in’s, no commitments and you’re totally in control of all your subscriptions. You can pause, upgrade, downgrade, cancel or change your subscriptions at any time from your member area on the website. Your payments get taken automatically as often as you want your products to come and they just get delivered straight to your door. No more needing to find the best deals or forgetting to buy your razors. Just a simple, effective service that provides quality products at fair prices. That’s an incredible package for the price, isn’t it? Sign up was simple, I opted to pay with PayPal and sure enough 2 days later I receive a nicely branded Sterling package address to, you guessed it – Lord Evans. Since I knew my package was on its way I decided to hold off having a shave and so had a good level of stubble to tame by the time it came for the Sterling test. The traditional shave cream smells very similar to the face scrub and again it is quite thick. I used some hot water again and worked it into my stubble, creating a rich, thick, white lather. I picked up my new Duke razor and took the first pass down the side of my face. It was absolute bliss; smooth, comfortable, close and effective. The razor was so sharp that if it wasn’t for the fact I could see the stubble had been removed I’d have thought it hadn’t actually cut anything at all. The blades didn’t seem to clog and excess hair was easily removed by a gentle rinse under the water. The Duke has a trimmer blade on the back, it’s not very obvious at all but it is there. This came in especially useful when I was trying to get the area just underneath my nose. I often find razors are too big to cut effectively up close in this area but the trimmer on the back of the Duke razor made this really simple. Not to mention it was great for squaring my side burns off as well. The handle felt solid and had lots of rubber grip on it, I think it looks very smart as well. A bit more modern then some of the Gillette razors you can get and especially the Mach 3 razor. The moisturising strip probably wasn’t needed as the shave prep was doing such a great job but you could imagine if you were ever caught short it’d make up the difference if you just had this razor and some warm water. I finished up passing the five blades across every inch of my stubble and washed my face with some cold water to close the pores. My face felt exceptional; no razor burn or rash and it was incredibly close. Too often razors feel like a toss-up between a close shave and getting some irritation., not with this Duke razor. Now for the final step, I squeezed some of the SPF15 anti-aging moisturiser into my palms and applied it to where I had shaved as well as the rest of my face. It was at this point I realised that all three of these products essentially smell the same, which was quite good as by now the smell had really grown on me. As you’d expect this moisturiser wasn’t as thick as the previous shave cream and face scrub, it massaged into the skin well leaving no residue. Sometimes I feel like moisturisers can leave my skin feeling quite greasy but this wasn’t the same experience, my skin truly felt moisturised rather than greasy. I’ll be honest, I rarely bother with moisturising but this product I thought was superb. It is Winter as a write this and so the SPF15 isn’t really of any use, but I can imagine in the Summer it could be the difference between burning and not – which we all know isn’t good for our skin. I was so impressed with these products I decided to leave them all on my on-going subscription. I LOVE this toothbrush, for a start it looks pretty cool but also, it’s just such a great idea. I always forget to buy a new one every three months like you’re meant to and so on subscription is great for me. The bamboo toothbrush came in a recyclable paper bag similar to what chop sticks come I, I guess to keep it hygienic. The bristles are fairly firm and the handle feels a lot softer than I was expecting. My biggest concern was getting a splinter in my mouth from the bamboo but the product is so smooth I realised there was no way that was going to happen. I’m not a big tree hugger, but I do appreciate the fact it is biodegradable, sustainable and not plastic and that’s a good feeling to be doing your bit to make changes. Beyond the above it did exactly what you’d expect of a toothbrush; it left my teeth feeling really clean. If you’re on an electric then this might actually save you a lot of money, the replacements on an electric toothbrush can get pretty expensive and they seem to need changing far more often than a regular manual toothbrush in my experience. The price is probably better than what I’d normally pay for a decent toothbrush in Tesco and it’s delivered to my door when I need it. Result. I’m definitely keeping this subscription going for life. Now this might have been the biggest surprise of the whole package. I really had no idea what to expect. On the website they describe it as ‘Award winning Gruhme No.14 Fine Fragrance. Aromatic wood accord with top notes of juniper berry, organic black peppercorn, bergamot, lemon, lavender with a heart of patchouli and cedar on a base of oakwood, amber and musks interlaced with traces of cumin, celery seed and petitgrain.’ I mean, what the heck is that going to smell like? I can’t say I’ve ever smelt a celery seed, I didn’t even know they had seeds…let alone in that concoction of ingredients. So, I know what you’re all thinking, you want me to tell you how it smells and now I see why it is so hard to describe. It certainly smells masculine and very fresh, when I look at the ingredients and smell it I can smell the aromatic wood accord they speak off but it’s so much more than that. It’s unlike anything I’ve used before but I can see why it is award winning, it truly is exquisite. Best of all, my wife loves it too, which is regularly not the case with my choice of aftershave. As this isn’t a main stream fragrance you know that it’s highly unlikely you’re going to know anyone else using it and so you can really make this fragrance your own. It came in a 5ml glass vial which doesn’t sound like much but there should be plenty for a months’ worth. The nice thing about it coming in the small glass vial is that you can keep it in a pocket and freshen up throughout the day as required. The one thing I would say about this product though is that it is very strong, it’s not like some of these fragrances you buy which seems to need to be reapplied every two hours. When you spray this stuff on you it really does last. Overall verdict? Love it. Going to keep this subscription running as well. I’d highly recommend getting the add on to the free sample pack just to try this product out – you won’t regret it. This product on its own is easily worth upwards of a fiver in my opinion. So, the real question is what are you waiting for? Sign up to the Free trial by Sterling Shave club, it’ll be the best thing you do today.